Thanks to Julie Boolie for this one!;-)-A.M. Aloha Planetary Kin: this is your Cosmic skywatcher, Randy Bruner, Blue Cosmic Hand, coming to you from 19.5° on the Big Island of Hawaii. These are epic times in which we are living and this Cosmic Moon is no exception to that. The Maya were avid skywatchers. To them the axiom “As above, so below.” was how they lived their lives. They watched the dynamic of the planets moving across the sky and lived their life accordingly. As I write this we are in the central column of the Tzolkin in the Mirror Wavespell. It is the Summer Solstice day, Yellow Spectral Star, ” I dissolve in order to beautify.” I’m finding seemingly endless order of correspondences of the planetary aspects and the Tzolkin. I will attempt to condense them for transmission to you. This Cosmic Moon, the last of the 7 Mystic Moons, contains an awesome set of planetary movements and aspects, which correlate very closely to the Dreamspell version of the Tzolkin. The outer planets move very slowly and are already in position as the inner planets move into aspects with them. Just after Galactic Synchronization, on the 4th day of the Magnetic Moon, July 29, 2013, the planets will form an almost exact Grand Sextile. The Grand Sextile also includes two Grand Trines. These are all very positive and harmonious aspects completely surrounding the planet in a Sacred Geometric configuration. This is an awesome alignment of the planets in the solar system emcompassing the Earth in the geometry of a Stargate. Here is an image of the astrology chart for the grand sextile. 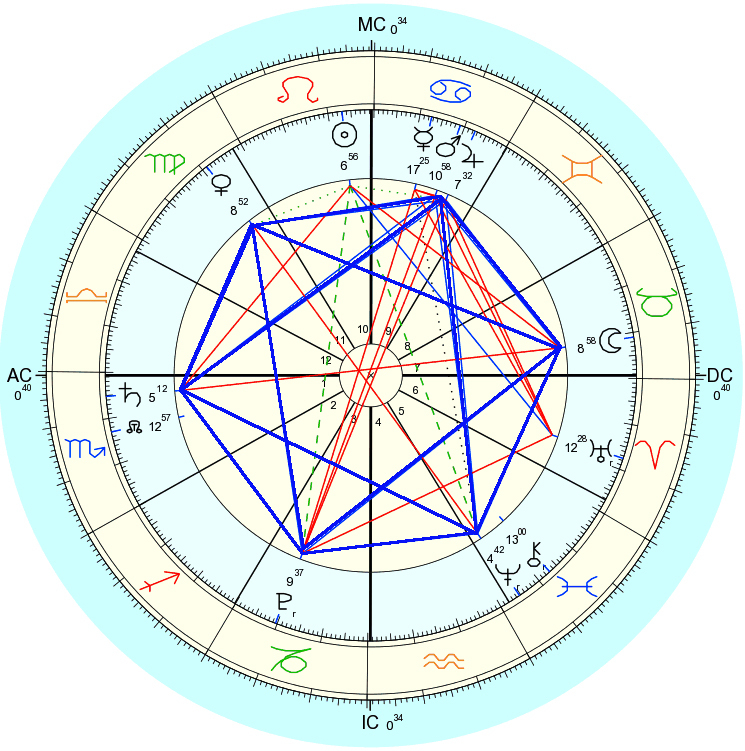 I accentuated the Grand Trine & Grand Sextile aspects to highlight their geometry. I’ve also included an image here of the sacred geometry held by the planets of the solar system around the earth during this aspect. Magnetic Moon 4, July 29, 2013, is the day of the Grand Sextile. It is encoded as Blue Spectral Hand, “I dissolve in order to know. Releasing healing. I seal the store of accomplishment with the spectral tone of liberation. I am guided by my own power doubled.” What an affirmation for planetary healing and upliftment. This aspect comes into play one week after the Full Moon of the Cosmic Moon, which is the last of 3 Super Moons in a row. The Super Moon is when the Full Moon falls on the day when the Moon is closest to the Earth. The Moon moves into position to create a Grand Trine with Venus and Pluto which also completes a Grand Sextile around the planet Earth. The Grand Trine with Venus, Pluto and the Moon signifies the possibility of transformation (Pluto) through the power of beauty (Venus) and love (Super Moon). The Grand Sextile is formed from the 2 Grand Trines that we’ve already talked about. The Grand Sextile forms a 6 sided, crystalline form around the Earth with 2 interlocking triangles inside. This is the geometric form of a Stargate formed around the planet Earth by the other planets in the solar system. This is the opportunity for direct download of galactic cosmic energy. The aspects of the Grand Sextile enhance the aspects of the Grand Trines that we already discussed. The conjunction of Jupiter and Mars is sextile to Venus, the power of beauty, on one side, and the Moon, the power of love, on the other side. This signals the opportunity for the power of love and beauty to overcome the power of war and religion. Then the planet Saturn, materialism, is sextile to Venus, power of beauty, on one side and Pluto, the planet of transformation, on the other side. This signals the power of beauty to transform materialism. Then we have the planet Neptune, the power of our highest hopes and dreams, sextile to Pluto, the planet of transformation, on one side and the Moon, the power of love, on the other side. This signifies the power of transformation to bring about our highest hopes and dreams through the power of love. This image appears to me to be the template for an altar to utilize for the Day Out of Time, the New Year and for the day of the Grand Sextile. I’ve included the copy of the astrology chart so that you can see the positions of the planets. For the purpose of the altar I would suggest placing stones on each of the points to represent each of the planets. Through this method we will actualize the Stargate in all of our ceremonies. You can, of course, just meditate on this image if you are a solo practitioner or group of individuals not able to create an altar for yourself. Four days before the Day Out of Time and four days after the Day Out of Time the Moon moves across the sky, forming conjunctions to the planets Pluto, Neptune, Uranus and then moving into place to take the last spot in a Grand Trine and forming the Grand Sextile. This seems to me to be a good time to hold energy and ceremonies for the transformation of humanity and the planet. I know that this is adding a lot to the Day Out of Time celebration. Stretching it out over more than a week may not be possible for many of you. But, this is the Big One we’ve all been waiting for. So, I think it is worth the effort to take the extra time to participate fully in the planetary ascension process. It is my suggestion that we extend our celebration of the New Year from the Full Moon before through the Grand Sextile on Blue Spectral Hand day and utilize this geometric pattern for ceremonies that we perform for the Day Out of Time and leading up to the Grand Sextile. In my opinion this signals the opening of the gate for Galactic Synchronization. It is the gateway to a New World and our new future as a Galactic Culture. Having delineated the aspects of the Grand Sextile, now we will discuss the planetary aspects and the Tzolkin correspondences in the Cosmic Moon which set the stage for it. First of all, the Cosmic Moon contains the Yellow Seed Wavespell. The Yellow Seed Wavespell contains 10 GAP days in a row. These are the GAP days for projecting into the future and allow us the opportunity to dream our future into being. So, in the Yellow Seed Wavespell, we plant the seed for our future. This, of course, prepares us for Galactic Synchronization at the beginning of the New Year, Yellow Galactic Seed. The 1st of the 10 GAP days in a row falls on Cosmic Moon 12, July 8, 2013, and is encoded as White Electric World-Bridger, “I activate in order to equalize.” This date is also the New Moon in the Cosmic Moon of Presence. So, the New Moon, the opportunity to set up new beginnings, begins the 10 GAP days in a row dealing with the future and allowing us to dream our future into being. The last of the 10 GAP days in a row falls on Cosmic Moon 21, July 17, 2013, and is encoded as Blue Crystal Eagle, “I dedicate in order to create.” Most of you know that the crystal tone is the tone of cooperation. This is our opportunity to cooperate in order to create a new world, a new future for ourselves and others. On the last of the 10 GAP days in a row, Blue Crystal Eagle, Jupiter moves into a trine with Saturn and Neptune. Jupiter, Saturn and Neptune in a harmonious aspect represents the possibility of our highest hopes and dreams (Neptune) being able to reclaim spirituality from religion (Jupiter) and replace materialism with abundance (Saturn). This begins to set up what will become a Grand Trine and the Grand Sextile just after Galactic Synchronization. Then, on Cosmic Moon 23, July 19, 2013, Red Magnetic Earth, “I unify in order to evolve.” Saturn moves into the trine with Neptune. This transforms the above aspects into a Grand Trine. It forms a triangle around the Earth in space and embraces the earth in the opportunity to evolve, since the Red Earth Wavespell bridges us over Galactic Synchronization. We move next to Cosmic Moon 24, July 20, 2013, White Lunar Mirror, “I polarize in order to reflect.” On this date the planet Mercury moves direct and the planet Mars moves up to conjunct Jupiter and enter the Grand Trine formed by Jupiter, Saturn and Neptune. Above we were talking about reclaiming religion and materialism with the energy of this Grand Trine. Now Mars is added in there, which allows us to replace war with peace. If we transform our action, the power of Mars, towards the upliftment of humanity and the Earth the Grand Trine will transform the power of Mars from the God of War to the God of Action. The day before the Full Moon of the Cosmic Moon of Presence is Cosmic Moon 25, July 21, 2013, Blue Electric Storm, “I activate in order to catalyze.” On this day the Moon eclipses the planet Pluto. The Moon, the planet of emotion, passes in front of Pluto, the planet of transformation. This activates the power of love, our highest emotion, to bring about transformation within humanity and on the planet. The next day is the Full Moon Day, it is Cosmic Moon 26, July 22, 2013. In the Tzolkin it is the day Yellow Self-Existing Sun. This day is also known as 4 Ahau in the traditional Mayan calendar. In the Mayan long count the date 4 Ahau is the beginning and the end of the last cycle. This acknowledges the Alpha & Omega of the grand cycles. It is also the last of 3 in a row Super Moons. The Super Moon is when the Full Moon falls on the day when the Moon is closest to the Earth. So, it is actually bigger in the sky, therefore a Super Moon. This of course means it has a greater effect on the Earth, the tides, the tectonic plates and our psyche. If we tie the power of love to the Super Moon imagine what we can do with that energy. Also on this day Mars moves up to conjunct with Jupiter. This solidifies the 1st of the Grand Trine aspects. This allows the power of love, Super Moon, to overcome the power of war, Mars, and the negative aspects of religion, Jupiter. This will, of course, bring about an ending and a new beginning in both of those areas. On the last day of the 13 moon calendar Cosmic Moon 28, July 24, 2013, the Moon moves into conjunction with Neptune. This adds the power of love from the Super Moon to the power of our highest hopes and dreams from the planet Neptune. This ends out the cycle of the 7 Mystic Moons. Then on the Day Out of Time, Blue Resonant Night, “I channel in order to dream.”, the Moon moves into conjunction with Chiron the healer. This allows us to channel the energy into our dream of healing the planet, which facilitates our path into Galactic Synchronization. On the New Year’s Day, Yellow Galactic Seed, “I harmonize in order to target.” We will all be gathering to celebrate and focus on bringing in and embodying the Galactic frequencies. But, there are still many more aspects yet to come and the most powerful planetary aspects are not until Magnetic Moon 4. Blue Spectral Hand. The 2nd day of the New Year, Magnetic Moon 2, Red Solar Serpent, ” I pulse in order to survive.”, sees the Moon move into conjunction with the planet Uranus. Uranus is the planet of the lightning bolt, which brings about quick, sudden sometimes all-encompassing change. The Moon as the power of love added to the power of Uranus to bring about positive all-encompassing change very rapidly is the essence of this aspect. It is important to note that there are some challenging aspects in this chart as well. As you can see, there are several red line aspects in the chart. These are aspects that will attempt to hold us back or bring us down. Now, more than ever, we are being asked to “rise above” the lower energies and hold a higher vision of the world. Now we must realize that it’s where we focus our energies that determine the results we get. I hope that some of you can take the initiative to create and perform ceremonies of enlightenment around each of these aspects. Because this is the Big One we’ve all been waiting for. It’s time to step up and participate in the planetary ascension process. If you wish to receive more detailed preparation for these monumental events, we will be opening a 4-week series of 2-hour webinars on Cosmic Moon Alpha 12, (Monday, July 8th.) That is the New Moon, White Electric Worldbridger and opening of the GAP! If interested, reply to this address : lightbeingsunlimited@earthlink.net for more details. The first session is free! And the others are only $20 for two hours of solid download in Randy’s clear, user-friendly style.